While summer won’t officially begin until June 20, the warm weather is already here and school is already out in most places. Depending on the type of business you run, this is either good news or bad news. 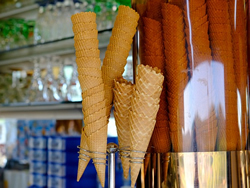 Some businesses see significant dips in income in the summer months, while some seasonal businesses operate exclusively in the summer. With millions of Americans preparing to travel, beautify their yards, or just head out to enjoy the season, this is the time for summer businesses to make money. For some, it’s the time to buckle down and strategize so their businesses survive the slow months. There are a number of strategies your business can use to stay afloat and continue to innovate, but one in particular is the tool that every summer business needs to stay on track and meet its goals. If you’ve kept up on your payments to your vendors and other credit accounts, you could potentially qualify for a business line of credit. During 2017, 33% of Nav customers applied for funding to either help cash flow or for expansion. And 40% of customers during this period applied for lines of credit, far more than any other type of financing. A business line of credit differs from a business loan in that interest will only be charged when you use money from the line of credit. While business loans and other sources of credit provide relief to business owners looking to smooth over a period of low revenue, make payroll or purchase inventory, it’s tough to pass up the flexibility and affordability of a business line of credit. A bank will approve a line of credit for a certain amount of capital determined by the applicant company’s cash flow and business credit rating. It’s always a good idea to check up on your credit before applying. You can check your business credit score for free with Nav. Similar to a credit card, interest won’t be charged until you pull money from the line of credit, and you’ll have a payment period for the balance you incur. Depending on a few factors, you may qualify for either a secured or unsecured line of credit. A secured line of credit is preferred because of the lower risk level for both the lender and borrower, and the lender’s subsequent willingness to allow a higher limit. Businesses with better ratings may qualify for an unsecured line of credit with a reasonable rate. It’s always better to be approved before you need the credit — applying for a line of credit while your company is struggling with cash flow may not be the best option. Looking ahead to periods like the summer months when your business may see a decline in revenue can give you a better idea of when to apply for a line of credit, so you’re not stuck in the mud instead of growing your business. As you look to continue to innovate and grow your business, don’t get caught in the dark this summer. A business line of credit can be the reasonable source of assistance that makes all the difference moving forward. About the Author: Connor Wilson is a writer at Nav, a free site giving business owners access to their business and personal credit scores, and tools that match them to the best financing and services.